We used Statto to help select the Dutch national mixed team for WCBU and sent trialees screenshots of their individual stats afterwards. The feedback was overwhelmingly positive. I’m very impressed with the app. Quickly switch views during a time-out to see live stats for the game you are tracking. Pitch heatmaps, pass completion rate, scoring efficiency percentages and more can help you make informed tactical decisions on the sideline. During half-time, check how players are performing to gauge their pitch-time. Filter players by how many points they’ve played to see who needs to get on and who’s being overworked. Sort players into groups like ‘D Line’ or ‘Handlers’ to make selecting who is on the line a breeze. Simply tap on the pitch to record the locations of passes, blocks, stall outs and more with less effort than tallying on paper. No video footage from a muddy battle on Pitch 14? No problem. 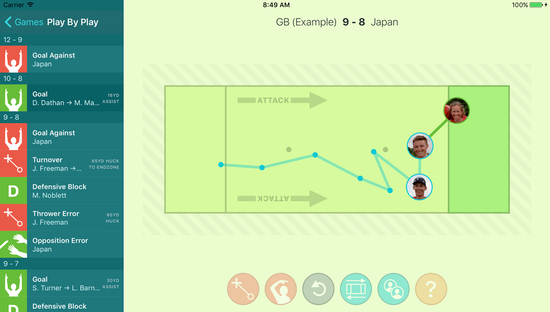 Review games back at home by scrolling through the Play By Play and see everything drawn on the pitch. The UAE national team was heading to Amman to play in the MENA 2016 championships so I thought I would give Statto a try. It’s super slick. Seriously great. Quick and easy to use which is key to following a game and recording stats. then use it forever for just $30.99. chip in a small amount to see their stats. Plus fine-grained detail in CSV exports and more charts in the works! Sam Rayner has played Ultimate since 2009 including EUC 2015 and WUGC 2016 with GB Mixed. He works as an iOS developer in Sheffield, UK and captains East Midlands Open. Will Statto work on my Android device or Windows tablet? Sorry, Statto is only available for the iPhone and iPad at the moment. I’m afraid I don’t plan to release a version for Android or Windows devices. Why is Statto so expensive?! I understand, most apps on the App Store are very cheap, if not free. For niche apps like Statto such low pricing is unsustainable and even popular ones end up neglected. I want to support users and improve Statto for years. If you’re a coach, consider asking the club or university to cover the expense. Your team might also be willing to pitch in a small amount to see their own stats. What happens when my 2-week free trial expires? You’ll still be able to view and export stats for all of your teams, games and players but you won’t be able to track any more games until you purchase Statto. Can I track two teams at once? Statto is designed to only track one team at a time. Tracking both sides of a game is too frantic to do live. If you need to track both, consider filming the game and watching it through twice. Do the stats I track get uploaded anywhere? Not unless you share them yourself! Your data is all stored locally on your iPhone or iPad to protect your team’s privacy. There are plans to make sharing stats publicly easier in future. I want to do my own analysis. Can I get at the raw data? Absolutely! You can export all of the raw stats in CSV format from inside the app. If you have any more questions about doing your own data analysis, feel free to email me at hello@statto.app.